The government has told all UK businesses that use or manufacture chemicals, to take action to register them in the UK to minimise disruption in the event of a ‘no-deal’ Brexit – a scenario where the country leaves the EU without a transition agreement in place. Chemicals are currently controlled under the EU’s registration, evaluation, authorisation of chemicals regulations (Reach), which controls which chemicals can be used, manufactured or imported in the bloc. But with just two months to go until the UK’s departure date, the chemical industry says the government has done nothing to allay its fears over continuing access to chemicals, given the tight timescales and costs of registering in the UK. Last November, a highly critical House of Lords report concluded preparations were not up to the task of maintaining adequate chemical regulation. The chair of the Lords energy and environment sub-committee has now said the government’s response to the report was ‘vague and insufficient’ and has asked for reassurances by the end of the week on the measures being put in place. Peter Newport, chief executive of the Chemical Business Association, describes government planning as ‘unworkable and not commercially viable … while government is telling us we’ll just have to cope’. In a no-deal scenario, companies have 60 or 180 days to register in the UK – depending on whether they are a UK or EU business – and two years to provide the new UK regulator, the Health & Safety Executive (HSE), with all the data that supported their original EU Reach registration. But companies don’t necessarily own the rights to the data that supported their Reach application, as industry made joint submissions, sharing data and costs. According to industry associations, UK companies hold around 12,000 Reach registrations and have invested over £550 million in the EU system. ‘It’s a balancing game [of] how much to prepare in advance and incur costs,’ says Nishma Patel, chemicals policy director at the Chemical Industries Association. Moreover, finding out who owns the data is not straightforward, as there may be multiple owners. ‘In a UK Reach there is no obligation for EU data holders to share data – it’s at their discretion, and also at their discretion how they value this data,’ according to Neil Hollis, reach coordinator at chemicals giant BASF. As a result, industry associations predict a reduction in the number of chemicals available in the UK if, for example, costly safety testing has to be repeated, or where companies are selling such small quantities of chemicals that the cost of registration outweighs sales. BASF’s own mapping exercise identified some 1100 substances where UK registration will be required to maintain supply chains. Of these, there are 400 where BASF – as a downstream user – doesn’t hold Reach registrations. Based on its experience of Reach, BASF estimates dossier compilation and submission could amount to some £65 million. For industry as a whole, there is little time to absorb the extra costs, compared with the 10-year rollout of Reach. Defra says a new IT system, being developed to handle registrations, will replicate the EU’s system, and be available from day one after Brexit. Industry, however, has not yet seen the system. 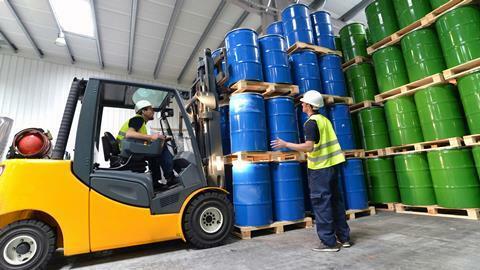 A Defra spokesperson said: ‘We are working to ensure any potential new burdens on UK companies are minimised’ and ‘are already well advanced in our preparations to ensure the HSE and Environment Agency have the resources and mechanisms they need to effectively regulate chemicals’.